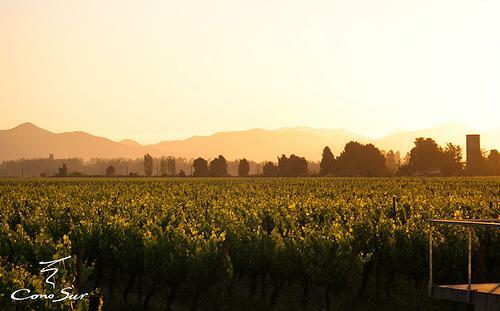 Cono Sur Winery takes its name from the shape of South America, the "Southern Cone". The winery is located in Chimbarongo which lies in the acclaimed Colchagua Valley of Chile. Founded in 1993, Cono Sur was conceived with the aim of creating innovative, premium wines that express the terroir, spirit and nature of New World wines. 2200 acres of grapes are grown in 40 different estate vineyards located north, south and in between. Cono Sur goes to any extreme to grow just the right grapes in just the right location with the goal of tapping the truest expression of terroir. Not satisfied to be just a face in the crowd, the team at Cono Sur started the Pinot Noir Project in 1999. The idea was to produce the best Pinot Noir in Chile. Later, that goal evolved into creating a world quality Pinot Noir, true to Burgundian tradition but also maintaining the expression of its New World roots. Cono Sur is now the largest producer of Pinot Noir in South America, and among the top five producers of Pinot Noir in the world. Martin Prieur of Domaine Jacques Prieur is a regular consultant for Cono Sur. “Light straw. High-pitched lemon and pink grapefruit aromas show good clarity and a touch of white pepper. Juicy, light-bodied and refreshingly bitter, with clean citrus and orchard fruit flavors showing modest concentration. Finishes with good nervy cut and lingering herb and citrus zest notes." Robert Parker 86"The 2007 Chardonnay Vision is medium straw-colored with a bouquet of white peach, apple, and a hint of tropical fruits in the background. It has good concentration, lively acidity, and a fruit-filled finish. Drink it over the next two years."